Thakkalikai kootu - This is how we call this kootu. We can make this kootu with green tomatoes or raw tomatoes. This is very simple to make and really yummy and it goes well with rice, chapathis and pooris. First pressure cook moong dhall with a pinch of turmeric powder and keep it aside. Wash the tomatoes and cut it into 4 pieces, if its too big then make it 8 pieces. Take a pan, put the tomatoes, add required amount of water, turmeric powder and salt and let the tomatoes cook. In the mean time, fry channa dhall, urad dhall, red chillies, black pepper and coconut, to golden brown and let it cool and grind it into a fine paste. when the tomato is half done, (half cooked) add the grounded paste and let it boil for another 3 to 5 mts. Now add the cooked dhall to it and add water to adjust the consistency. Let it boil for another 5 mts. By the time, tomatoes will be fully cooked. Make sure tomatoes are not mashed while doing these processes. Now pre heat oil in a pan, splutter mustard seeds, when it is done, add urad dhall and asafoetida powder and fry it till golden brown. Pour it on top of kootu. Garnish it with curry leaves. Enjoy with white rice or with chapthis or pooris. 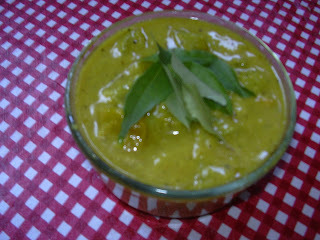 Kootu looks really YUM..I have never heard about green tomato kootu..should try it out sometime..
Hey thatz a nice recipe vidhya ..
Kootu looks perfect. favorite dish of my family. Wow nice and easy recipe. 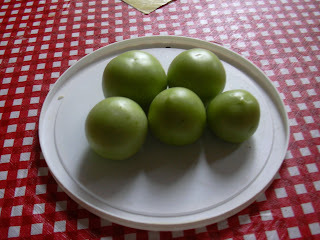 never tried green tomatoes in kootu. looks lovely.